Product prices and availability are accurate as of 2019-04-17 15:42:26 UTC and are subject to change. Any price and availability information displayed on http://www.amazon.com/ at the time of purchase will apply to the purchase of this product. In eleven seasons with the Buffalo Bills, the diminutive 5-foot-9, 175-pound Steve Tasker was a huge contributor as the Bills strung together an unprecedented four consecutive Super Bowl appearances in the early 1990s. Along the way, Tasker earned seven invitations to the Pro Bowl, and during the National Football League’s seventy-fifth anniversary celebration, he was named the greatest special teams player of all time. In this newly revised edition of Tales from the Buffalo Bills Sideline, the football star turned network television analyst takes a behind-the-scenes look at the franchise’s most glorious era. 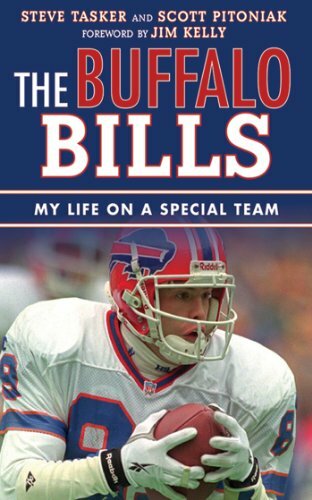 Tasker provides readers with insightful vignettes of colorful Bills personalities such as Marv Levy, Jim Kelly, Bruce Smith, Thurman Thomas, and Ralph Wilson. Tasker takes the reader inside the helmet of NFL players, describing everything in great detail for the most devoted Bills fans.